Spider-Man is amazing — one of the most resilient characters in the medium. A half-century of comics, cartoons, TV series, and feature films ensure there’s a take on Spider-Man for every taste, whether he’s a wise-cracking, colorful costumed crime fighter, or the shadowy, “Emo Spider-Man” of the new film. In his day, Spider-Man has gotten married, buried his aunt, traveled to the ends of the universe, and bonded with an alien symbiote. He’s ridden Spider-Cycles and Spider-Mobiles, been sold on toy shelves as a fishing hero, and co-starred with the Hulk on a toilet paper roll. That Spidey as been pushed and pulled in so many directions yet still maintained his basic identity speaks to an amazingly strong core character concept. That core concept is Peter Parker. 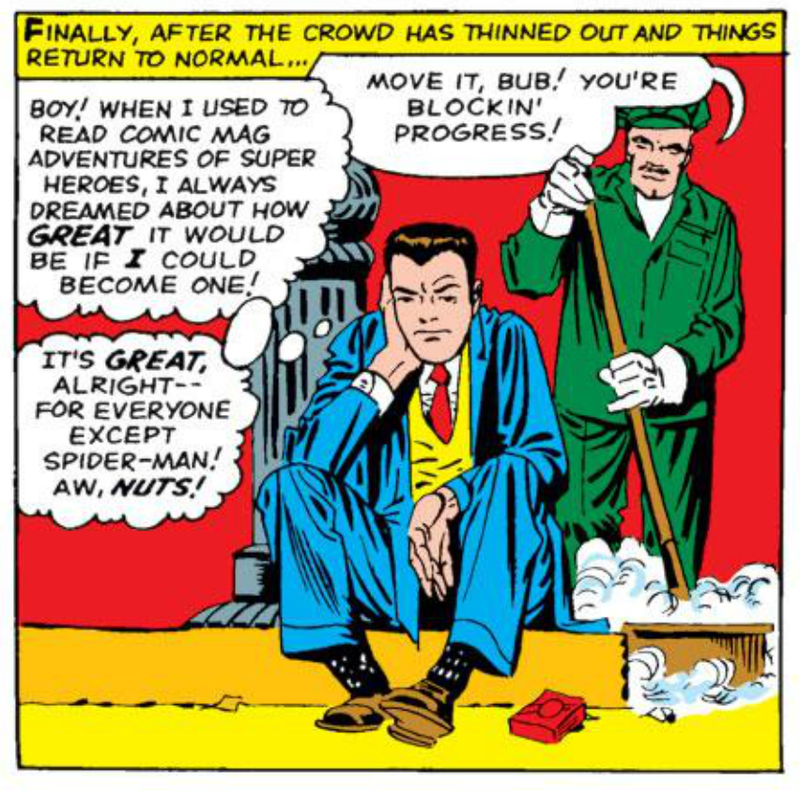 The Amazing Spider-Man was the second huge comics reinvention for Marvel Comics, who struck gold with Fantastic Four by swimming against the tide. Instead of the remote and infallible superheroes of the Justice League of America, with their secret identities and selfless defense of fictional American cities, Stan Lee and Jack Kirby‘s Fantastic Four were public celebrities who fought amongst themselves as much as they did with their rivals, defending the very real streets of New York City against invasions from the roots of the earth or beneath the sea. Mr. Fantastic and The Invisible Girl would have fit right in with the Justice League, but the monstrous Ben Grimm — who regarded his powers as a curse — and the hot-headed teenaged Human Torch were something fresh on the comic book scene. Teenage life and burdensome superpowers are central to Amazing Spider-Man, but this time our hero wouldn’t be the morose rocky Thing, or the comparatively well-adjusted junior member of a fantastic foursome. Spider-Man’s alter-ego, Peter Parker, is a bookish high school science student, forever short of cash, caught between girls, bound by guilt and love to his dotting Aunt May, and beset by a host of problems that any teen would recognize. Peter’s powers free him to swing about the rooftops of Manhattan and develop an uninhibited, heroic public persona, but even if his powers aren’t quite a curse, they do complicate his life, and beset young Parker with frustrations and moral dilemmas that only the young man beneath the mask can solve. It’s the frustrations and anxieties of Spider-Man that make him a transcendent character. There’s little doubt that Spidey will eventually defeat the Green Goblin or the Lizard, but will he get the money he needs for his Aunt’s medicine? Will the public finally give Spider-Man his heroic due, or will they continue to fall for the mean-spirited propaganda of Peter’s boss, newspaper editor J. Jonah Jameson? 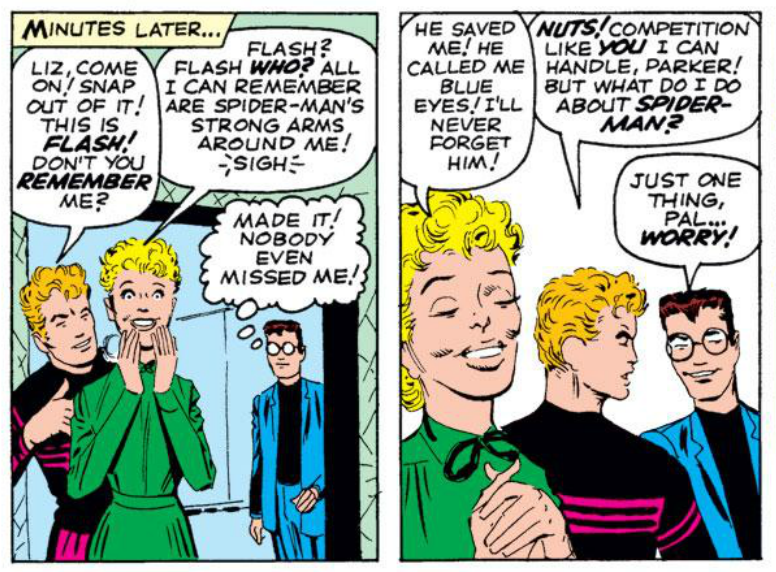 Will Peter ever get on the same page as pretty career girl Betty Brant, and is Liz Allen really interested in Peter, or is she just trying to make Flash Thompson jealous … a jealousy that makes Flash bully Peter in front of their whole High School class? It is the stuff of basic soap opera, but it works brilliantly in The Amazing Spider-Man. The harder things get for Peter, the more we cheer for him, and in those rare moments when the planets align and Peter earns some temporary victory, we share his triumph in ways more personal than the adventures of a Thunder God or a Sentinel of Liberty can allow. The Stan Lee/John Romita run is rightly regarded as the classic era of Spider-Man, where the many supporting characters were solidified, Spidey’s villains soared to new heights, and the soap opera beats of the series were tuned to perfection, but on balance I prefer the first three-odd years of the book. 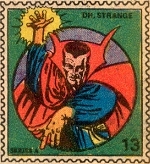 Starting in Amazing Fantasy #15, and continuing in the first thirty-eight issues of Amazing Spider-Man, Stan Lee and Steve Ditko created the foundation of a Spider-Man mythos that is still going strong a half-century later. 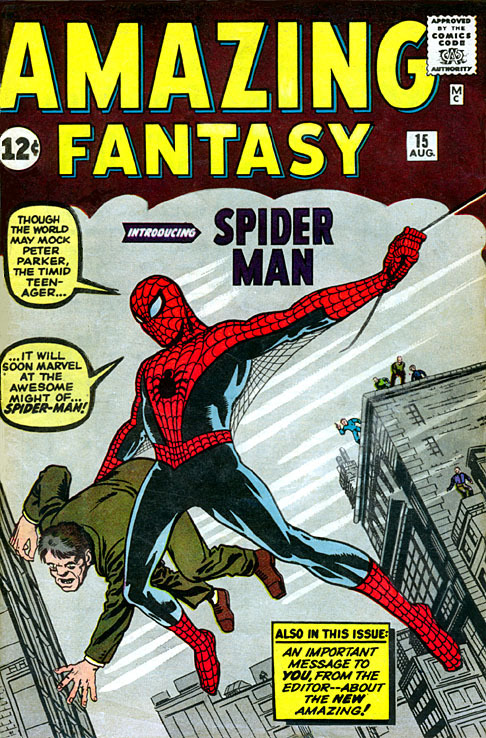 I don’t count Spider-Man among my favorite heroes (getting no end of grief for leaving him off my Top Ten List of Marvel Heroes), but even I would love to own a copy of Amazing Fantasy #15, both for it’s best-in-class origin story, and for a cultural relevance that ranks it among the most important treasures in our pop culture universe. That iconic cover was by Jack Kirby, but the character was pure Stan Lee and Steve Ditko (and the degree to which each man built the myth will forever be grist for the mill of comics fandom). 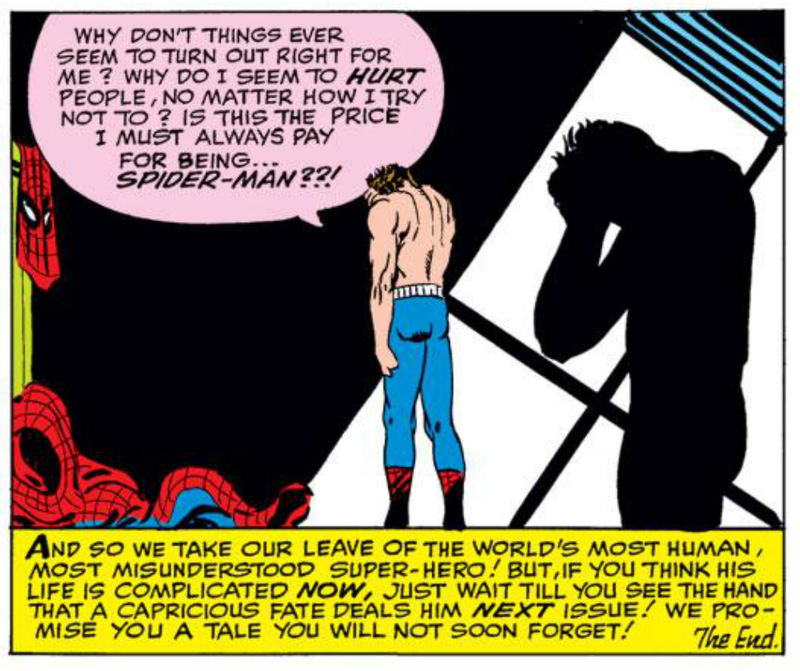 In Ditko and Spider-Man, the man and the hour met in ways that are still being felt, but it would take me decades to appreciate it. 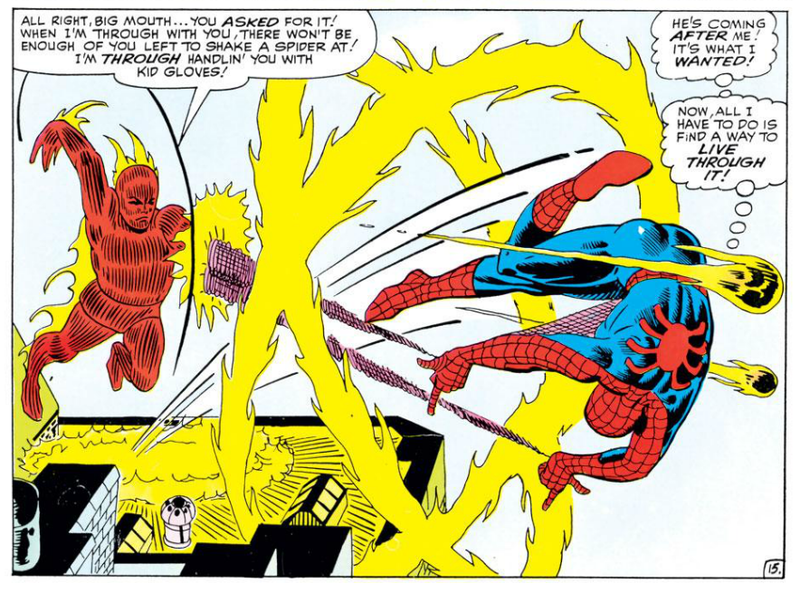 To a kid coming to comics for the first time in the 1970s, Steve Ditko’s Spider-Man seemed reedy and cartoonish, more akin to mouldering newspaper comic strips than the dynamic Marvel house style characterized by artists like Kirby and John Buscema. Unimpressed by the out-of-step Ditko stories I encountered in reprint (and equally uninspired by the Gerry Conway/Ross Andru doing Spidey at that time), little twelve-year-old me dismissed the “over-rated” Spider-Man in favor of the broader and more overt heroics of Marvel’s Avengers, Thor, and Captain America. It’s only been in the last year that I tumbled to Ditko’s Spider-Man, and I tumbled hard. Especially when viewing Ditko’s work in blown-up panels — as dictated by the digital Marvel Universe Unlimited subscription plan that I’m using for this review — I can at last appreciate Ditko’s brilliance. For years I dismissed Ditko’s work for its lack of heroic proportions, or absence of detail, but now I can see Ditko wasn’t omitting detail, but attacking his work with a cartoonist’s sense of economy, reserving his pencil just for the most important subject in each panel. If Ditko opts for a featureless, solid color panel background, it is only to concentrate our attention on the subject he has drawn. 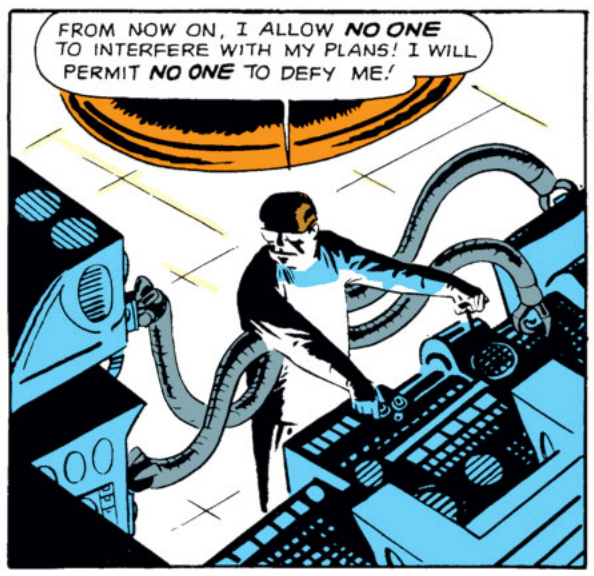 … or even just the inner workings of one of Spider-Man’s many foes, who often had “scientific” origins of their own. It was hokum, of course, but in the context of a comic book it all makes sense, and these many details help ground the series and maintain our suspension of disbelief when Spidey is battling second-rate bad guys like the Circus or Crime, or taking on Doctor Doom in a particularly embarrassing episode in issue #4. … while science fiction events often drive the book’s plot, with space capsules, aliens, and the Vulture’s magnetic wings featuring in the first three issues alone. Doctor Octopus is a brilliant atomic researcher, the Sandman has a radioactive origin, and Doctor Curt Connors turns himself into the Lizard after researching a regenerative cure for his missing arm. 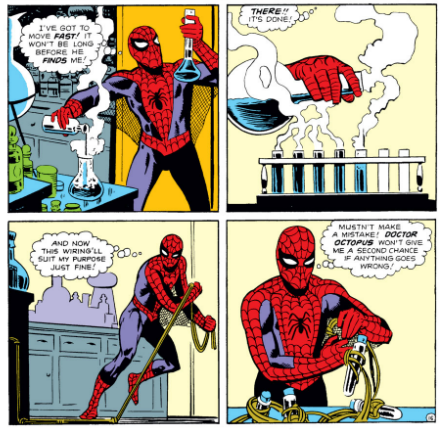 But this book isn’t always science gone mad, as Peter uses his own scientific know-how, both in creating his web shooters and web fluid, but also putting his book smarts to practical use against the bad guys. After the first half-dozen issues or so the emphasis changes to street hoods and organized crime, as Spidey takes on “The Big Man” and his Enforcers, and runs afoul of ambitious gang lords like The Crime Master and the Green Goblin. 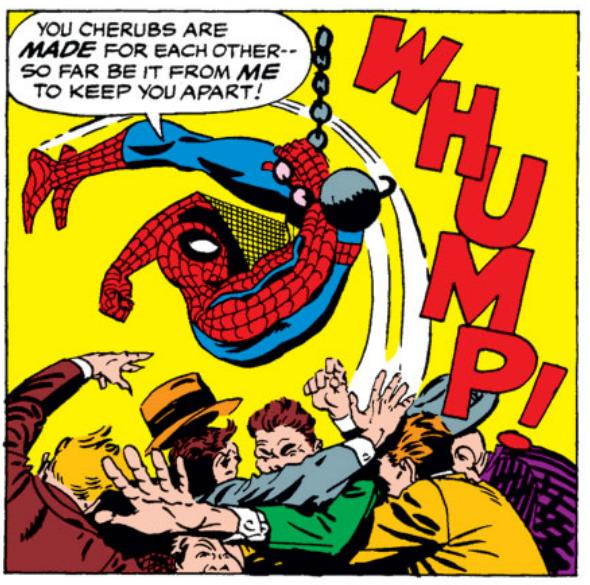 These tales usually afford Spider-Man the opportunity to take on a big mob of mooks, and Ditko never missed a chance to show us Spidey fighting from the ceiling, or swinging into action from some inventive new angle. Again, it was the details that made these stories sing — not just in the art but also in the story. Spidey is famously thwarted from cashing a check made out in his name for lack of I.D., but there are other details, too, things that never happened to Superman, like when Spider-Man loses his costume and has to buy a knock-off from a store (which them shrinks and falls apart on him during his adventure), or just the simple act of Peter graduating from High School in issue #28, marking the passage of time in a way unique for books of the time. But it is the psychological details of the story and the characters that are most memorable. Peter’s internal and external conflicts clash perfectly in Amazing Spider-Man #24, one of the finest single-issue stories in this run. Mysterio hatches a plan to drive Spider-Man mad … and considering the sudden effect that a few special effects movie tricks have on Spidey’s confidence, maybe he was on to something. All the elements of Peter Parker’s life come together in this tale — J. Jonah Jameson turns the public against Spider-Man, Flash Thompson tries to bully Parker, Liz Allen and Betty Brant tug at Peter’s heartstrings, and Aunt May gives Peter a little guilt trip. It’s the perfect neurotic superhero stew! Small wonder, I suppose, that Peter has a minor nervous breakdown in this issue. Focusing an entire comic story on a hero’s psychology and interior life in 1965 has to be considered groundbreaking, but we’re so comfortable living inside Peter’s head that the tale reads as just another day in the life of Spider-Man. And no matter how high Peter may swing above the concrete canyons of New York, this thoughtful and insecure side of Peter is always ready to bring him crashing back to earth. Reading these issues these past several months has been an absolute delight, which I recommend without reservation, even to fans of the grim and gritty new Amazing Spider-Man movie. 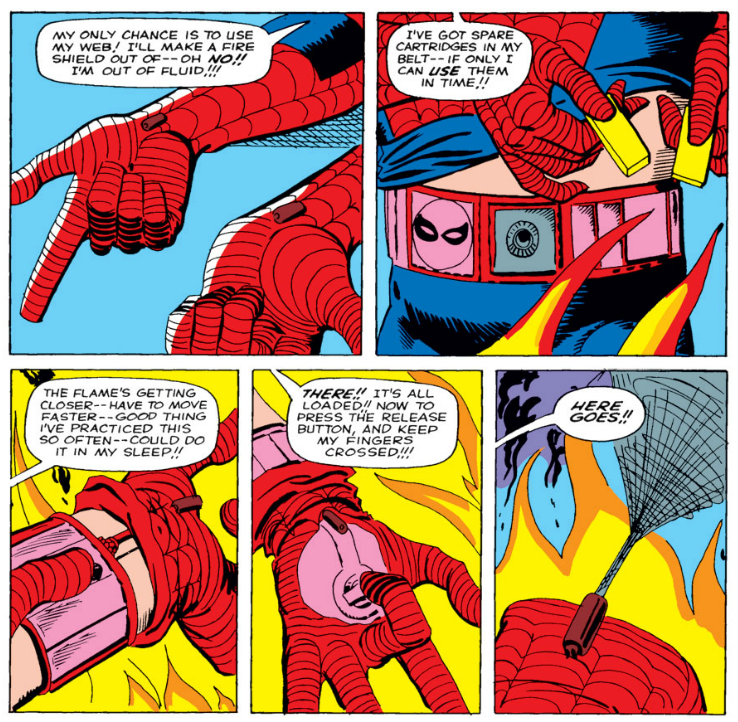 There’s room enough in our world for cinematic Spider-Men and Ditko Spider-Men and everything in between, but these Ditko issues really are not to be missed, both because they lay the foundations of a modern pop culture phenomenon, and because they are a master class on comic book storytelling. In my reading I captured dozens more images than I could display in this column, but I’ve put everything over in my Amazing Spider-Man Pinterest gallery for you … and join me back here next week, when I take a close-up look at Steve Ditko’s “Amazing Spider-Faces,” too. 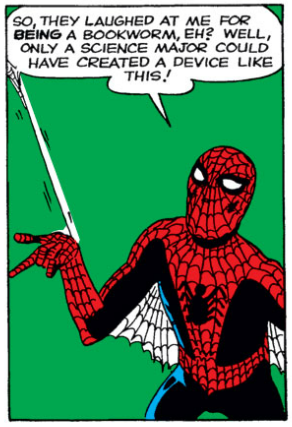 In the meantime, enjoy the movie, and revisit the Lee and Ditko originals, to best enjoy the most amazing Spider-Man of all. Posted on July 4, 2012, in Reviews and tagged Amazing Spider-Man, Marvel Comics, Peter Parker, Spider-Man, Spidey, Stan Lee, Steve Ditko. Bookmark the permalink. 38 Comments. Looks like the movie is off to a fast start and that Spidey will maintain his popularity headed into his next half-century. Spider-Man turns fifty this year … and so do I. Here’s to the future for both of us. I’ve revisited these issues as well and agree with you on Lee-Ditko vs. Lee-Romita. One thing that sticks out to me is the number of classic Spider-Man villains created. Under Lee-Romita, we get a few: Rhino, Shocker and Kingpin. Under Lee-Ditko, we get a pantheon: Vulture, Doc Ock, Sandman, Lizard, Electro, Mysterio, Green Goblin, Scorpion, Kraven the Hunter, the Beetle and the Molten Man. Night and day between the two eras! Couple this with Ditko’s knack for detail that you bring up with the web shooters. Bottom line: Steve Ditko could design characters! And, something else. 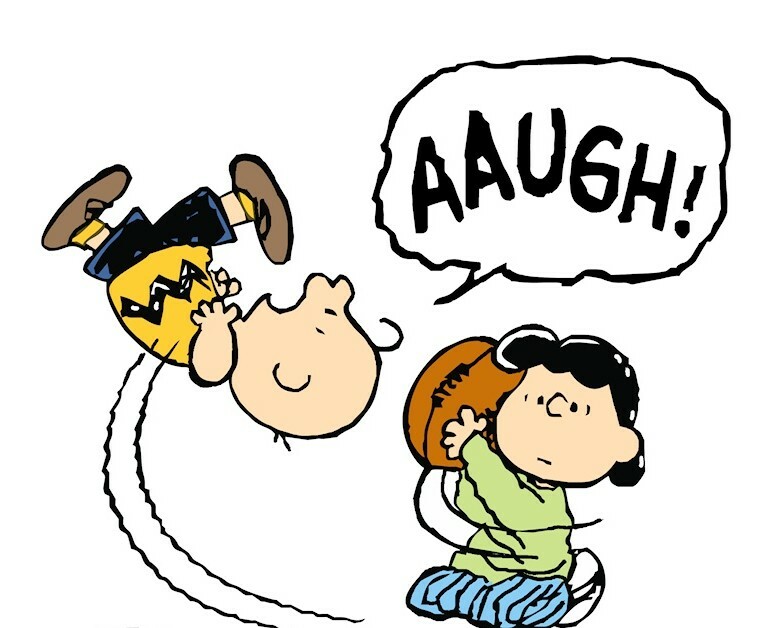 You mentioned in a prior blog how modern comics have gone away from the single issue story. There are a lot of single issue stories in the Lee-Ditko run. In fact, the first 10 issues of Amazing Spider-Man are single issue stories. Individual stories that still maintain continuity. Yes, it can be done! Good catch on the character design — you are right, Horace, there’s a classic new Spidey villain introduced almost every issue in this run. There’s a post to be written just about Spider-Man’s bad guys … I think his rogues gallery is among the strongest in comics, topped only by Batman. And you are right, this is mostly a series of single-issue stories — and those stories cover a lot of territory. In issue #6, we’re introduced to the Lizard; Peter wrangles a plane ticket to Florida out of J. Jonah Jameson, then gets admonished by his aunt; Spidey fights the Lizard; Spidey meets the Lizard’s family and concocts an antidote to his curse; Spidey fights the Lizard (again) and defeats him; Curt Connors is cured and reunited with his family; Peter has a romantic misunderstanding with Liz Allen. All in 22-odd pages. It was a different era … that would be a six-issue run today. As a fan of single-issue stories there is an embarrassment of riches here. My single favorite is issue #24, which I called out in the blog, because of the way it gets inside Spidey’s head. I love Mysterio’s gag where he rivets furniture to the ceiling to make Spidey think he’s losing it, and the insecurities and neuroses exposed in young Peter Parker are really quite sophisticated. I was tempted to spotlight this issue for my Dollar Box feature over at StashMyComics.com, but I went with the Lizard origin in Amazing Spider-Man #6 to better tie in with the launch of the movie. Finally, Horace, I must thank you for your role in the secret origin of this week’s column. I likely wouldn’t have gone back to take another look at the Lee/Ditko Spider-Man if you hadn’t taken me to task for leaving Spidey off my Top Ten Marvel Characters list. As I noted in the column, seeing these early books through fresh eyes was a revelation, and experiencing this run (again, and for “the first time”) has been one of the great joys and gifts of writing Longbox Graveyard. Thanks for keeping me honest, True Believer! Thanks for the kind comments. And, thank you again for the Longbox Graveyard blog. It provides an outlet for some of us old-school Marvelites. Regarding Ditko, I have to confess that, like you, I wasn’t blown away by his stuff when I first encountered it as a youngster. In the late 1970’s, he was doing lower profile work at Marvel. Stuff like Machine Man. 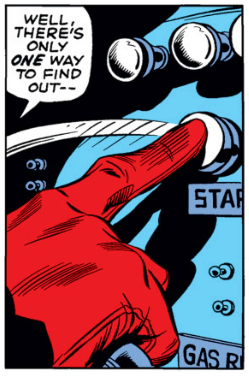 Or, the occasional fill-in like Daredevil #162. It wasn’t until later that I got what Ditko was about. His lofty stature in this medium. Fortunately being late to the party still gets us to the party, both of us. In an alternate world Ditko would have continued creating for Marvel for decades, but we have what we have, and what we have is pretty darn spectacular (Or “Amazing,” to stick with the theme). Thanks for the kind words re: the blog, Horace, and I hope to see you at Comic-Con! Great post. I realised this week that I don’t own any Spiderman comics. I’ve read plenty but don’t have any on the shelf. I might need to change that after I see the movie. I gave away my stack of Conway/Andru comics and I don’t think I have a single copy of Amazing Spider-Man in my Accumulation. I do have some “Web” and “Spectacular,” and might build out my Marvel Team-Up collection just because. I do highly recommend these Steve Ditko issues … there was a an Omnibus a couple years ago that was worth every penny of it’s $99.00 cover price (and costs much more now on the secondary market). But I think digital might be the best format for this series — Ditko’s page layouts were pretty perfunctory, so you don’t lose a lot of gestalt by not seeing entire pages in one go, but there’s a real joy to seeing his work blown up big and beautiful on your computer monitor. Enjoy! I just ❤ this blog! You lads are just so nice and know everything about comics. ‘Spidey Sense tingling’ and stuff? I had a similar experience with my youthful encounters of “weird” Ditko Spider-man, then, as an adult, going back and totally getting it. I think, really, Romita (was was, make no mistake, awesome) was only better in one way: he could draw pretty girls. Ditko’s Betty was as anxious and twisted-looking as his Parker and his Gwen wasn’t much better. But other than that, yeah, I’m saying Ditko for the win. Re his rogue’s gallery: I think it’s Annual No. 1 that has a gallery of all Spidey’s foes to date. It’s pretty interesting, with one incredibly dated throw-away (the Electronic Brain or suchlike) and then pretty much all guys who have stuck around for the next half-century. Hey, Matthew, thanks for reading and commenting! I hope you will become a regular correspondent here … and I like your Spidey-inspired avatar! On balance the Romita years are more mature and fully-realized Spider-Man comics I think — the formula really comes into its own here, the supporting cast is more deeply developed, and as you note Romita is able to leverage his romance comics chops to put some heat into Peter’s love life. When I originally went back to review Spider-Man for this column, I started with the first Romita issues … but then decided to go back even further, and the rest is history (insofar as this blog is concerned, anyway). I was already tumbling for Ditko after reviewing his Doctor Strange, and a fresh look at his Spider-Man just tipped me all the way over. I do still want to get back to those Romita books to re-experience their own particular charms but these Ditko books are special in ways that few comic runs can match. Yep, that’s the Amazing Spider-Man Annual #1 that you’re remembering … I read digital copy a couple weeks ago, and it was a delight, a very light and fast-moving story teaming Spidey with Doctor Strange, highlighted by Spidey stumbling into that characteristics Ditko “otherverse” that he drew so well, and of course those pinups that you remember. Seventy-odd pages, all original material, all Ditko. They truly don’t make them like that any more! I have always found myself just as interested in the creators as their creations. In the late 70’s and 80’s I actively sought out Ditko reprints. His work was so unique from everybody else. Longbox Graveyard is open 24/7, 365 days a year for all your nerdly needs, Tom! Thanks for reading and posting! Ditko Spidey art must really resonate with older individuals because after finding myself rather non-plussed with his work for years (but feeling like I HAD to respect him since he is the co-creator of Spider-Man) I very, very recently developed a honest-to-goodness lovefest with Ditko. Granted, JRSR is still numero uno for me when it comes to Spidey artists, but Ditko almost resides in a class by himself because his visual interpretation and overall tone he creates for ASM #1-38 is one of the most unique things you can find in the Silver Age. The reason I think Ditko fails to resonate with modern readers (and in this I include my 12-year-old self, way back in 1974) is that Ditko is a cartoonist first and a comic book artist second. He uses cartoonist shorthand to convey emotion and personality, and his work owes more to great comic strip artists like Chester Gould, Milton Caniff, and Al Capp than it does the more conventional, action-oriented superhero comic book artists of the day. 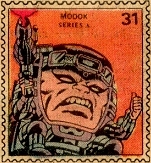 Jack Kirby uses many of the same shortcuts, but he gets a pass from fans because of his relentless action and broad-shouldered layouts (and his work remained familiar, because it formed the foundation of Marvel’s house style in the decades that followed). Enjoying Ditko requires adjusted expectations and effort to concentrate what he does well — once you stop expecting his Spider-Man to look anything like what followed, the love affair you describe can fully flower. For me the key was seeing this art digitally, up close, in isolated panel view, so I could fully appreciate the expressions on Ditko’s faces and the craft of each panel. It took me forty years to begin to understand what made Ditko so special on this book. Glad to see you’re starting to appreciate Spidey a bit more (he’s always been my favourite, so I have to stick up for him :)). I first read these Lee/Ditko issues in the Marvel Tales reprints from the early 80s and I loved them as much as the Stern/JR jr stuff that was new at the time. Of course I also love the Lee/Romita stuff…and the Conway/Kane stuff…and the Conway/Andru stuff…and…well, you get the idea! With you on Lee/Ditko and Lee/Romita, though we part ways on Andru and Kane … I just have a tin ear for those guys (though I do not deny their talent). Much of my distaste for Spidey comes from first experiencing that book on a particularly dire run from Conway and Andru in the mid-70s.